Reusable beverage bottle with integrated infusion elements. Add fruits, veggies, or herbs to flavor spirits. I plan to buy more! This was a Christmas gift that my son had to try right away. He loved it. I purchased this as a Christmas gift, so it hasn't been used yet. But I was very please with the weight and construction! bought it for my wife who loves to infuse things! Deciding to drink more water is easy. Following through is the tough part. To make it more palatable, try spiking your water with fresh fruits, veggies, and herbs. All you need is one handy gadget: a Zinger. 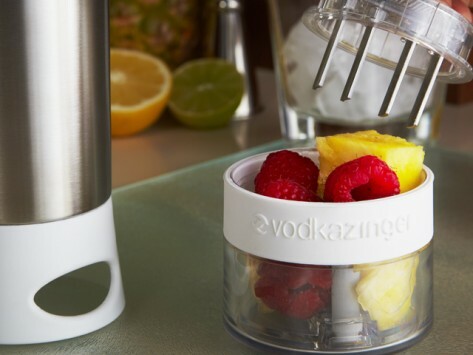 Created by Josh Lefkovitz, Zing Anything’s water bottles and pitchers have an integrated grinder. 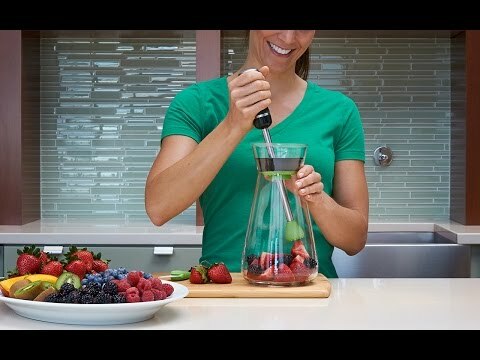 To make your own vitamin-enriched water, add fresh fruits, veggies, and herbs—strawberries, lemons, cucumbers, mint . . . you choose the ingredients and Zinger does the work. These bottles and pitchers are designed to give you intense fresh flavor. Some designs have a compartment in the base that you twist to pulverize the ingredients. Others have a juicer. With a shake of the bottles, or a mix of the muddler on the pitcher, the juice and essences disperse into your water. A mesh screen keeps seeds, leaves, and skin separate. Josh created Zingers because he wanted to drink more water, but he found it flavorless and boring. He tried other methods of infusing water with natural fruit flavors, but none were as fast, convenient and portable as he wanted. After a few years of trial and error, his Zingers took shape. With a Zinger, drinking water doesn’t seem like a chore anymore, and artificially flavored drinks aren’t nearly so tempting. At home, in the office, or out on the trails, a Zinger makes it easy to crank up the flavor.